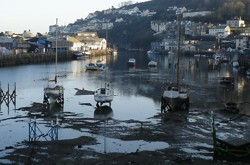 West Looe is the quieter half of this thriving Cornish Harbor town. The houses, inns and shops of the town are built into the ragged crevice formed by two hillsides, and gives the appearance of a town defying gravity. 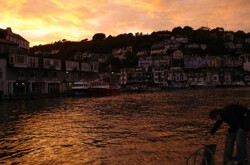 Like all ancient fishing ports, West Looe boasts a string of legends and ghastly tales. A ghostly white hare is seen disappearing in The Jolly Sailor Inn, a portent of misfortune, while the quayside remembers tales of the 'press gangs', smugglers and pirates. As you walk along the quayside, with the water lapping gently at the boats, it is all too easy to believe the stories, and get drawn into the romance of it all. It may be romantic now, but smuggling was an offense punishable by death. The poem, below, by Rudyard Kipling, follows a fretful night for the smugglers of Cornwall, as the customs men hunt high and low for those carrying contraband goods. while the Gentlemen go by! 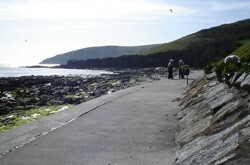 West Looe is also connected with Hannafore, by a pretty (and very high!) coast road. Follow the lane round to one of England's best preserved 1930's seaside settings. An immaculate set of tennis courts, bowling green, teashops and promenade could be straight out of an Agatha Christie murder mystery. It's a genteel location, with fantastic views of the coastline, and nearby Island.